Well Boogiepop has both of those in spades just two episodes in. I am watching food wars. I hate to cook myself, but after watching I feel like I should go and cook. The plot is a bit usual but has good interpretation. Imagine fighting tournament, where people use not weapon, but dishes. Yes, that's it. Developing a love for cooking is a great boon in life! And honestly it's all about your mental image of the process. If you really are interested, I recommend a YouTube channel called 'binging with Babish'. He makes dishes from movies and TV shows (which includes Food Wars, coincidentally). He's just a self taught guy, and really gives you the impression on how fun and easy cooking really can be. Is anybody watching Rising of the Shield Hero? It's really pretty good so far. I thought it would be pretty generic at first, but then the betrayal happened it's a pretty cool dynamic that the hero now hates everybody. I know Vacant is watching it. It's pretty cool sounding, although my schedule it pretty filled right now between Mob Psycho, Boogiepop, JoJo, (and soon) Dororo. Yeah I'm keeping up with it. I didn't think that I'd enjoy it from the synopsis and PV's but its been alright so far. I'm intrigued to see how they develop his shield and how big and bad these waves can become. These days I`m rewatching some old series from OPM and Bleach - blast from the past! Nice! I was just re-reading old bleach because I finished my bleach collection. Well, to put that in context, I got the first 21 volumes. That's the whole of the shinigami Arc, because hell no am I spending the extra money and storage space for the full manga. Still trying to get back into anime, I can't watch any shows these days. I started Servant X Service but I think I'm done with it after 10 episodes...there is only 3 more but it's really nothing special. I like the idea, just Civil Servants working in their office, encountering some problems at work and in their own lives. The tone of the show is just off for me, things like the boss being a remote controlled bunny plush and all. The cast is fine, the animation is boring, the designs are also nothing much. It's really quite a plain series, I enjoy a few aspects of it but it's so mediocre I just...don't need to watch the last few episodes. But when the long awaited sequel to my second favorite anime ever Full Metal Panic can't even get me watching shows again...what can? I don't even want to watch Full Metal Panic 4 and it was for me the most ultimate anime sequel that could've been made, but in a way the time for that came and went. I'm totally out of the anime loop at the moment. I did try drawing to anime which worked well enough, but now I'm trying to push my art productivity to the maximum so all distractions got cut. That being said I'm still catching up with Meitantei Conan but barely an episode a day now. Finally! The first anime I've finished in 10 months! This is a very nice show, it might seem like the idea of a 17 year old who loves her 45 year old manager is creepy but the premise isn't even what this show is about. 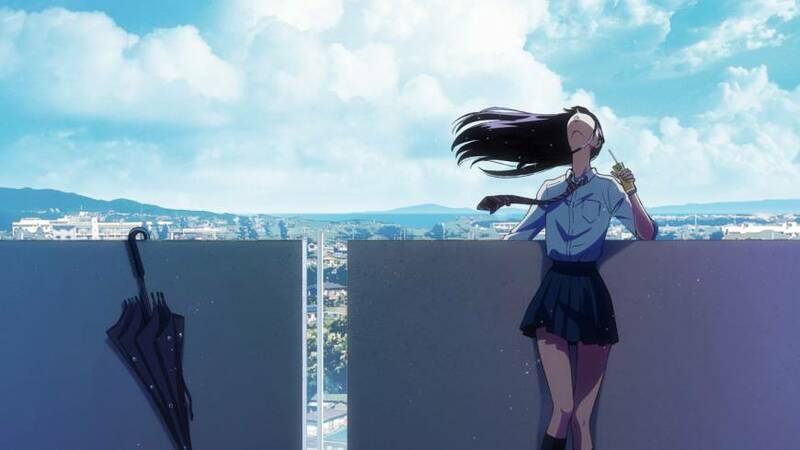 This is a tale of two characters with their own little problems and set backs, a story of emotions one can't help but have, and how Akira and Masami work out things in their life by forming connections with each other. Though this show has romantic elements, it's not so much a romance anime. It's about the different emotions the characters have, Akira and her fading friendship with Honoka, and foot injury that's kept her from being a great runner. and for Masami it's coming to terms with his age and lack of youth, and finding the confidence/inspiration to start writing again. There are so many great parts in this series, and both Akira and Masami have their own unique issues that overlap. I really liked the relationship Masami has with his old friend and classmate Chihiro, it felt like they where real friends. This show's view of friendship is really great, it shows a real understanding of old friends, and the way these two characters of different ages can relate to each other is also unique. Early on Akira experiences so many emotions for Masami and it's presented in one of the best ways I've ever seen a show do. There are so many movements and expressions she has that really capture the feeling so well, and the show has the right pace and atmosphere to pull it off. These feelings evolve as well, and Akira is really fleshed out as a great character, same with Masami. This show does very well in presenting the characters emotions, things are slowly revealed about the two and it never feels creepy. It's not meant to be that kind of show, it's about how the two characters connection helps them in other regards of their life. I really liked what this show did and the themes it presented, both characters where fantastic and the side characters did the trick, there was less drama that I thought, and for the better. The show maintains a good theme throughout and uses silence very well. All the flashy scenes when Akira experiences intense emotion where great, and the little things she observes and uses. I love characters like this, Akira and Masami really feel like real people, and there are so many small relatable things about both of them. The animation was okay, there where some odd bits and the characters look decent enough for this type of show. The soundtrack was alright, though only a few pieces really helped the mood. Voice acting was very well done across the board and Aimer's ED is awesome. The OP isn't bad either, I like the animation. This is a really nice show and I'm glad it pulled off it's theme so well. This is not some weird love story, it's a look into two characters lives and their emotions, and it's done so well. Good stuff. Dub on Netflix. Amazon is so terrible you can't tell what is dub and mostly get mine fielded into sub. Tonight a big pile of Diskotek just showed up. I finally get to see Area 88!